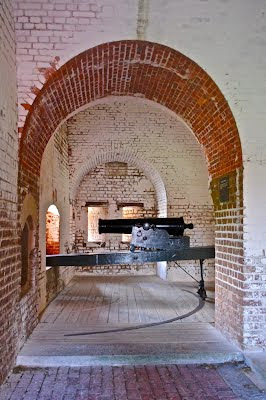 The quick fall of Fort Pulaski in 1862 surprised and shocked the world. 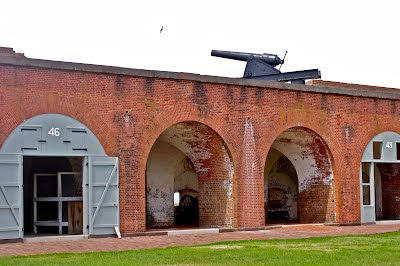 When the Civil War began, Pulaski ranked as one of the "most spectacular harbor defense structures" in the United States. 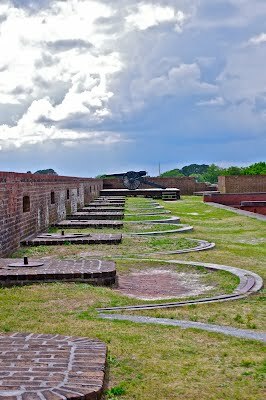 Many considered the fort's 7 1/2 ft solid brick walls backed with massive masonry piers unbreachable, including the US Chief of Engineers Joseph G Totten. "You might as well bombard the Rocky Mountains", was how he summed it up. It took them 18 years and 25 million bricks to build it. The battle fought April 10-11, 1862, marked a turning point in military history and included the first significant use of rifled cannons. 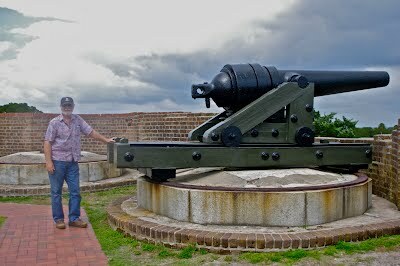 Union forces on Tybee Island bombarded the fort for 30 hours, eventually forcing the surrender of the Confederate garrison. Upon the bombardment's conclusion, the fort's southeast angle lay in ruins. The battle clearly demonstrated the improved power, range and accuracy of rifled cannons and also signaled the end of masonry fortifications. 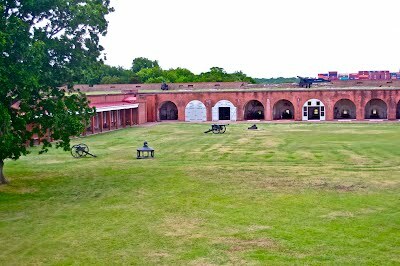 The fort is wonderfully preserved and open to the public. As we arrived, a guided tour by one of the park rangers was just getting started, so Jack eagerly joined in. I tagged along to listen a bit and take pictures. As Civil War "stuff" goes, it was pretty interesting, especially when you think about how many years it took to build, and how many hours it took to destroy and how all that changed "war fighting strategies". Jack had a wonderful time exploring every inch of the place. I, on the other hand, looked for interesting angles to shoot, and to see if I could capture a shot of the nearby Cockspur Island Lighthouse! We both had a good time!